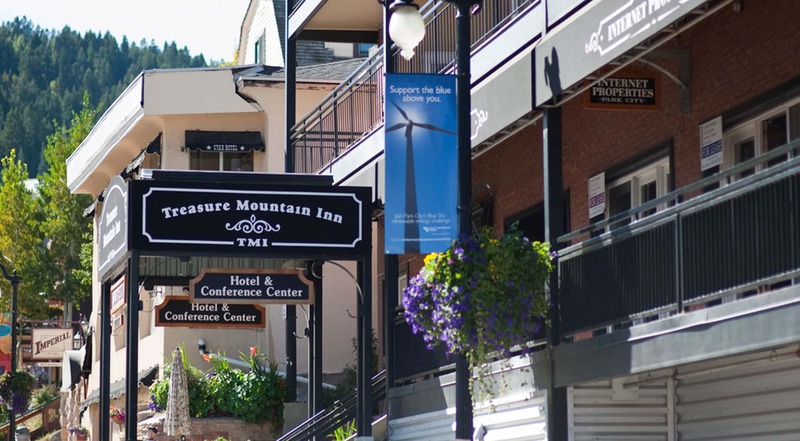 The Treasure Mountain Inn Hotel and Conference Center is ideally located where the mountains meet Main Street, in the heart of Historic Park City. Perched at the top of Main Street, surrounded by all of Park City’s best activities, the hotel is just a short slide, stroll, or stumble from the ski slopes, restaurants, and après-ski. The Inn offer's a variety of dignified accommodations ranging from hotel room sized junior suites, to spacious one-bedroom suites, or for large families, two-bedroom suites. Treasure Mountain Inn is an earth-lovin’, tree-huggin, carbon reducin’ hotel and proud of its green practices. Check out the live street cam for a peek at the fun or to get a current view of the weather. Treasure Mountain Inn is comprised of 3 buildings occupying about an acre of land between Main Street on the east and Park Avenue on the west. There are 31 one-bedroom suites, plus the lobby, 3 conference rooms, the restaurant and an assortment of commercial enterprises in the Main Building. There are 12 junior suites and 12 two-bedroom units located in the two Park Avenue buildings. Even our smallest rooms have fully-equipped kitchens. Centrally located is our xeriscaped courtyard with super-Jacuzzi, firepit and gathering areas ideal for catered events in the out-of-doors. We have an abundance of parking—both garage and off-street reserved—but we always prefer you use the robust around-town bus system rather than hassle with a rental car.